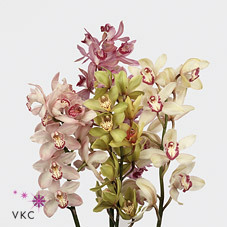 Cymbidium Orchid Mix lrg - 12 Buds (Mix may vary to image) is a strong, seasonal Mixed cut flower. It is approx. 50cm and wholesaled in Batches of 12 stems.